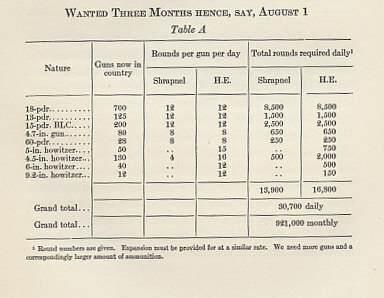 A table of shells requirements from a May 9, 1915 memorandum by Sir John French, Commander of the British Expeditionary Force 1914 and sent to Members of Parliament David Lloyd George, Bonar Law, and Arthur Balfour. French also provided some of the information to Colonel Repington, the military correspondent for the Times of London, who published his story on the 'shell shortage' on May 15, 1915. 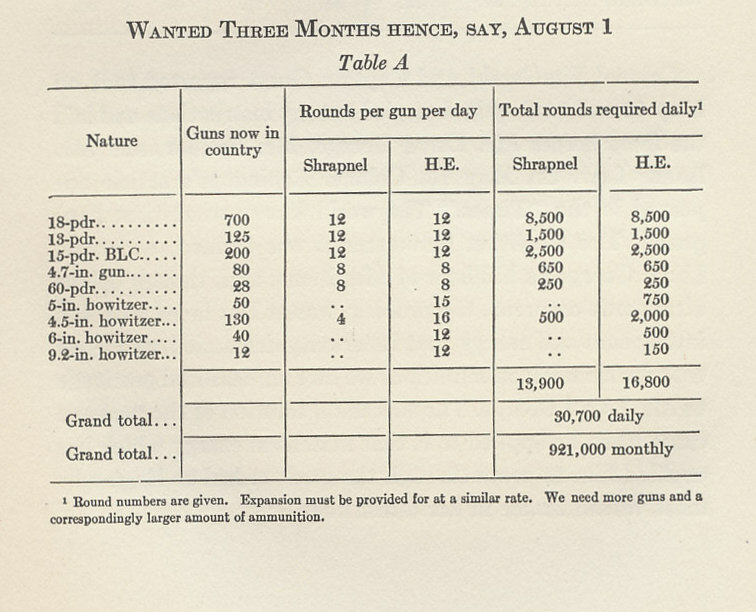 No combatant nation was prepared for the war's demands of men and materiel. General Foch repeatedly recorded French Commander in Chief Joffre's concerns: On September 14, 1914, Joffre 'prescribed that ammunition be husbanded, especially the high-explosive shell,' repeating his command five days later. Joffre said a critical situation might become tragic, and that Foch would receive no more shells for his 75 mm field guns - the mainstay of the French Army - for two or three weeks. In Russia, French Ambassador Paléologue was distressed on December 17, 18, and 19, 1914 that Russia lacked not only ammunition, but rifles. Like the Entente Allies, the Central Powers also lacked adequate supplies. As Austria-Hungary retreated before the Russians in September 1914, it had no stockpiles. German Commander in Chief von Falkenhayn wrote the war 'established totally new standards for the requirements of matériel,' but Germany resolved its ammunition shortage by spring 1915. In part because of the shell shortage, British Prime Minister Asquith was forced to form a coalition government in May, 1915, bringing in David Lloyd George as Minister of Munitions.